As per Brian Overton's historical note at the back of Gunhawks #1, Western stories have been with Marvel since the Timely days. Thus, in the company's 80th anniversary year, we get to enjoy this Western one-shot. It's retro in its basic tropes, but it delivers some wonderfully modern moral complexities. 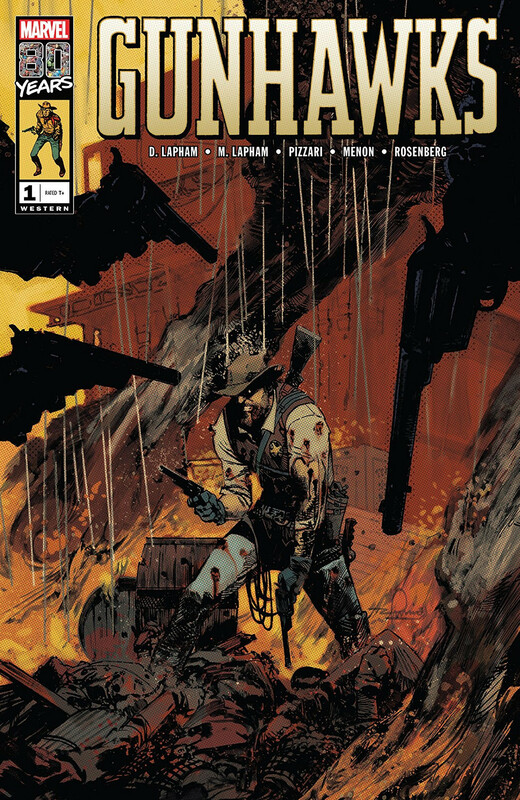 It begins with a sheriff facing down some Mexican bandits, but even before he discovers that his assailants are women, we get some twists in the standard-issue Western setting. It's 1914 in Arizona. The late date is required to contextualize the sheriff. He's a veteran of the Mexican Revolution (which would actually still be ongoing), and the women hunting him are soldaderas working for Pancho Villa. The sheriff gets a moment to explain the beef thanks to a pretty fiancee whose main role is catching his exposition. He was sent (with other mercenaries working for Huerta) to assassinate Villa. There were massacres and counter-massacres, and of the dozen Huerta-hired guns, only the sheriff survived. Until now. If the story's characters are a little flat, it's eminently forgivable thanks to their clear purpose: To set the stage for the sheriff's complicated moral quandary. It is, yes, of course, a very "Stray Bullets" kind of quandary, and it's the heart of this story. The art and the colours also concentrate on setting a stage and realizing a mood. My only visual complaint would be that the sheriff himself is a little slippery and generic. That could, of course, be intentional; this story interrogates its protagonist's heroism quite a lot for a one-shot. The palette does a good job bringing forth the punishing sun of Arizona. Direct sunlight washes out the most vibrant colours, but they're still lurking in the heavy shadows, ready to strike at a moment's notice. And the blood! Coloured and drawn to glorious excess in the climactic fight scenes, it gouts out like arterial salsa. The copious carnage serves a useful purpose in the final scenes, making the resolution of the story feel appropriately larger-than-life. Gunhawks #1 delivers something more complex than a "white hats vs. black hats" fight. It uses a fateful day of gunplay to ask fascinating questions about moral growth and it lets the sheriff work out his own bittersweet answer. It's subtle and thoughtful and highly rewarding. The "blood on the book" panel at the end does go a little over the top with the symbolism.